If you're an experienced sea kayaker you will enjoy Panama Canal tours from Gamboa, it reveals rarely seen views, and leave you satisfyingly exhausted, then you will enjoy a thorough exploration of the Panama Canal Chagres River, from Gamboa to end. A dam at the river's northern terminus, just before it meets the Atlantic Ocean, forms Gatun Lake, which makes up the main body of the Panama Canal. You'll hear the roar of howler monkeys from the vast jungle on your left and spot giant ships from a safe distance on your right as you paddle the length of Gatun Lake, sleeping in wilderness camps along the way. The idea of a canal across the Isthmus of Panama was first envisioned by Charles V, the King of Spain in 1534. Spanish conquistadors at that time used the natural flow of the Chagres River to transport treasures from the new world to Spain. Mules hauled their plunders over land to Gamboa where they took smaller row boats along the Chagres River from Gamboa all the way to the Atlantic. Roughly the same expedition in which you'll explore in its modern capacity on days 4, 5, and 6 of this trip. American interest in a convenient route between the Pacific and the Atlantic oceans was Spurred from the gold rush of 1849 and led to the construction of the Panama Railway, finished in 1855. But France began the first real efforts of building an inter-ocean waterway across the isthmus in 1881, but financial hardships and 22,000 deaths, largely due to disease, brought an end to the project 8 years later. Americans picked up where the French left off and began a massive undertaking of completing the canal in 1904, a project of great ambition that took 10 years and brought the Panama Canal to fruition. Currently, 4% of world commerce passes through the canal annually, but a growing demand for global shipping efficiency has necessitated the construction of two new locks that will allow much larger vessels to pass through the canal, a project with an expected completion date in 2015. Every time a ship crosses the canal toward the Pacific Ocean at Pedro Miguel Locks or toward the Atlantic Ocean at the Gatun Locks, 52,000,000 gallons of fresh water are bled from Gatun Lake, once the world's largest artificial lake. With the growing increase in traffic and with the addition of new locks, the demand for fresh water will continually rise. Thanks to the Panama Canal, Soberania and Chagres National Parks were formed to protect vast tropical forests that procure the Canal's main power source—fresh water. On this trip you'll not only explore the canal itself, but venture into the heart of the jungle where an impressively large watershed forms the head waters of the Chagres, which is not only vital to the canal but also necessary for supplying the Panama City- Colón area with enough fresh water to support their growing populations. 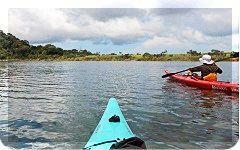 You'll start off at the confluence of the Chagres River with Gatun Lake entering Gatun Lake alongside the Panama Canal. With the creation of Gatun Lake, many mountain tops were turned into islands. This area offers endless channel possibilities to scout. In its shores covered by dense tropical forest you will find all kinds of exotic flora and fauna. This was discovered by the Smithsonian Research Institute that has operated the famous Tropical Research Center of Barro Colorado since 1946, an Island you'll observe from your kayak as you paddle around it on your way across Gatun Lake. At the Northern end of Gatun Lake, you'll once again enter the remains of the Chagres, as you take the river from Gatun Dam all the way to the Caribbean, ending your time on the water with a tour of Fort Lorenzo, a fortress that once guarded Spanish conquistadors from the infamous Caribbean pirates. We will greet you at the Tocumen International Airport and shuttle you to a Panama City Hotel. At the hotel, we will hold a welcome meeting for the group at 7 p.m. in the lobby. We will pick you up at your hotel at 9 a.m. for a complete tour of the city. After all that paddling, you will have a relaxing and efficient tour around the more interesting sights, giving you both a historic and modern look at the city. You will learn about the development of the Panama Canal and its economic impact at the Miraflores Locks. Here, you are able to see passing ships and you can enjoy a documentary about the creation of the canal, its economic and strategic impact, and the upcoming expansion of the Canal. The Panama Canal Museum offers interesting artifacts and a close overview of the French and American approaches to constructing the canal. Once you are a canal expert, we'll tour the city. In Casco Antiguo, also called San Felipe, you will see a spectacular view of Panama City with visits to historic buildings such as San Jose Church, The National Theater, The Metropolitan Cathedral, The Old Slave Market and the Old Spanish Prisons. You might also be interested in a visit to the Old Panama Ruins, a strategic spot for Spanish trade during colonial times. On the Amador Causeway you will be in awe of the beautiful sight, here 3 islands were connected with the mainland by using materials removed during the Panama Canal excavations. You get to choose from several gourmet restaurants and enjoy the view of ships leaving the Canal and exciting the city. You will be driven to Gamboa at the confluence of Chagres River with Gatun Lake where we will start paddling across to the west side of the Panama Canal. From here, your exploration of the canal really begins. You will be paddling in a narrow channel reserved for smaller vessels just outside of the Panama Canal shipping lane, practically in the shadows of massive Panamax vessels (a name reserved for the largest possible ships that can traverse the canal). Birds such as the king fisher and fishing eagles are common here. Ideally, you'll find a spot for lunch where you can watch turtles and Jesus Lizards (lizards with the ability to walk on water). Eventually, you'll make your way around Barro Colorado, a famed Smithsonian natural research island. Relying on navigational techniques to make your way through the tropical islands that guard the western passage around Barro Colorado. At the end of the day, around 4 p.m. you'll set up a wilderness camp on a smaller island adjacent Barro Colorado. After practicing 'leave no trace behind' techniques while taking down camp, you will truly put your paddling skills to the test as you tackle what remains of Gatun Lake, starting around 9 a.m.
Islands become less frequent in this section of the lake, and you will feel as if you are paddling through open waters, guided by a small lighthouse in the distance. This section also offers unique views of large shipping vessels in the canal. You can track their steady progress from a distance, one after another as you yourself, travel alongside them. Hopefully, you will find a nice shady lunch spot on one of the few islands in the middle of the lake, around noon. On the far side of Gatun Lake you will see ships lined up, waiting for their turn to enter the locks and continue their passage through the Atlantic Ocean. Large families of howler monkeys are known to roam the jungle forests in this area and will no doubt applaud your completion of Gatun Lake with their signature howl. Today you will meet up with your driver who will take you to the north side of Gatun Dam and you'll start kayaking around 8:30 a.m.
You will putt in directly downstream of Gatun Dam just in time to watch the jungle awaken, likely encountering some morning mist. This is the final stretch of the Chagres River, that flows into the Atlantic Ocean. After 3-4 hours of paddling through dense tropical forest, you will reach the Caribbean, with a view of the old Spaniard conquistadors' Fort San Lorenzo. You will be transported back in time as you explore the remains of the once crucially important fortress, that starting in the XVI century, prevented Caribbean pirates from using the Chagres to launch surprise attacks on Panama City in the Pacific. After visiting Fort San Lorenzo and having lunch, we will head back toward Panama City and reach the hotel around 4 p.m.
To get in and out of this area, by road, we will go across the Panama Canal by way of the Gatun Locks in our vehicle. This is a one of a kind experience because these are the only locks designed as a vehicular bridge. We will get familiar with the lock's operation as we wait on passing ships as they cross through, giving us a first hand look at the lock process. On the 8th day we will send you off with a shuttle back to the airport. All mentioned transportation, rafts or duckies, sea kayak(tandem or single) and related gear, camping gear, guides, trip's meals. Our guides are trained in river and sea navigation skills, first-aid and CPR. All mentioned ground and ocean transfers within Panama are included. This land package set departures are designed for couples, friends, or singles above 18 yrs old that enjoy to team up for paddling in the outdoors. Lodging has been chosen considering local style, comfortable and basic accommodation with out luxury. However, any person from twelve to 65 years old, in good health, ready to walk for about two and a half hours through an irregular and muddy path could do it with minor modifications(Minors must travel with a responsible adult). Private groups with some customization can be arranged. WHAT SHOULD YOU TAKE ALONG? Daily items: Swimsuit or a pair of short for navigating, sneakers or light boots with good soles, a cap, sun-block, a light jacket or windbreaker (in case the weather turns chilly), a towel and dry set of clothes for after the day trip. Blanket, flashlight, personal hygiene items. WHAT SHOULD NOT BE BROUGHT? At day tours leave object than can be deteriorated by water or valuables like jewels, cash, credit cards, etc. Group leader will go free for a group of more than ten persons. 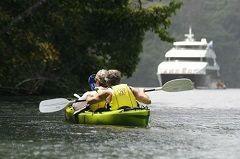 Panama Canal tours from Gamboa is a year-round package. The rainy season in Panama starts in April-May and ends by November-December. Due to changing river water level it can not be defined in advance where we will stay the night on river shore. From January through March a steady north wind prevails, that makes paddling difficult and may cause some necessary changes in the itinerary. (1) Aventuras Panama reserves the right, at its sole criteria, to exchange program with similar activities or accommodations in case it considers it necessary. (2) Participants should get familiar and agree with Aventuras Panama Terms and Conditions.